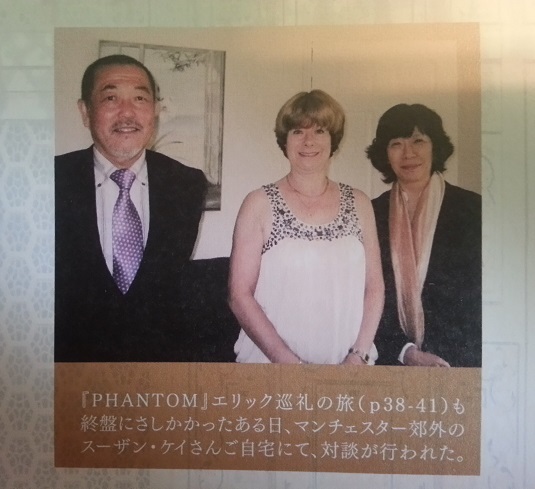 I found an interesting bit of news about a recent stage version of Susan Kay's Phantom that was apparently performed last year in Japan. It featured an all-male cast, and the official site can be found here. 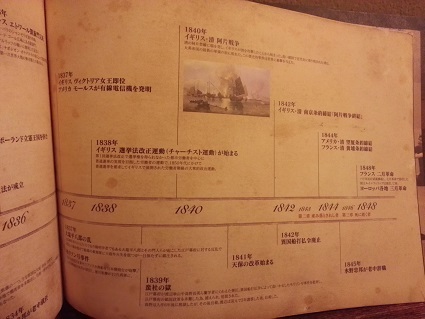 There's also a Russian site featuring some photos, most of which were also on the Japanese site. This production had some big names in the crew, particularly set designer Matt Kinley (who also worked on the Les Misérables 25th anniversary concert) and lighting designer Nick Simmons (who worked on War Horse in the West End). 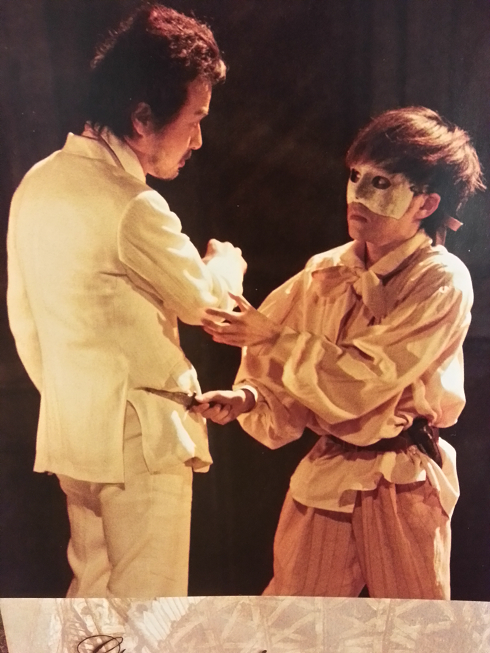 It seems to be a play rather than a musical, as I can't find any composer credit on the staff page. Does anyone else have any more info on this? Wow. That's really cool. In the blog on the official site there's even a photo of several copies of different editions Kay's book most of which I have plus a photograph of the author herself. Kinda surprising that there aren't more production photos though. Just a tiny poster of the cast in costume that I can hardly make out any details in. Will have to keep an eye out for more info, if any surfaces. I wonder if it was successful enough for them to tour it or revive it. Wow great, why not here? 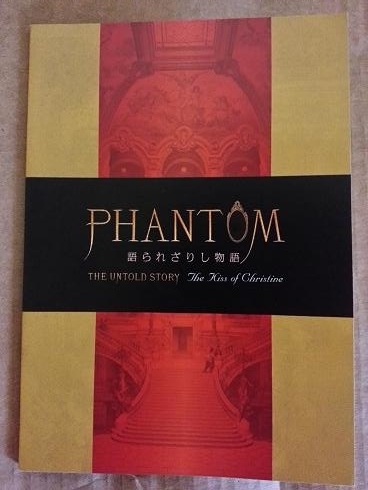 After much research, I have finally figured out how to purchase the DVDs of Studio Life's Japanese production of Susan Kay's "Phantom" (The Untold Story/The Kiss of Christine). 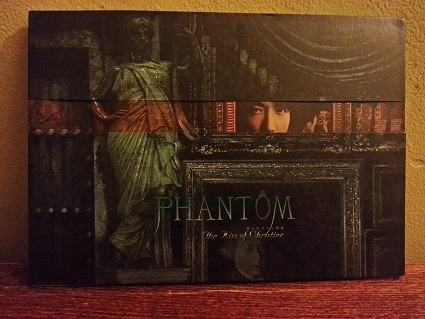 I followed the steps that I've outlined below, and I received my 4-DVD set of of "Phantom" today! 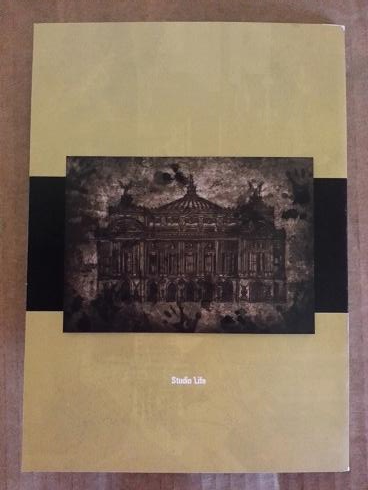 The primary problem with ordering from Studio Life is that, like many Japanese companies, they do not ship out of the country. I figured that I couldn't be the only person who had encountered this problem with a Japanese company before, and so I researched how other people from overseas purchase products from Japan. After some sleuthing, I found a company called Anislo (https://anislo.jp/) that serves as an intermediary between Japanese companies and customers abroad. Basically, you sign up for an Anislo account, you enter their address at checkout, and your package is shipped to them. 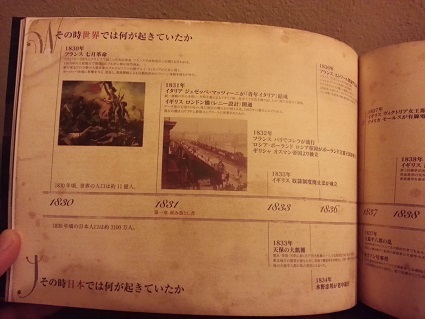 Then once Anislo receives your package, you pay them a shipping/handling fee to send the package to your address. 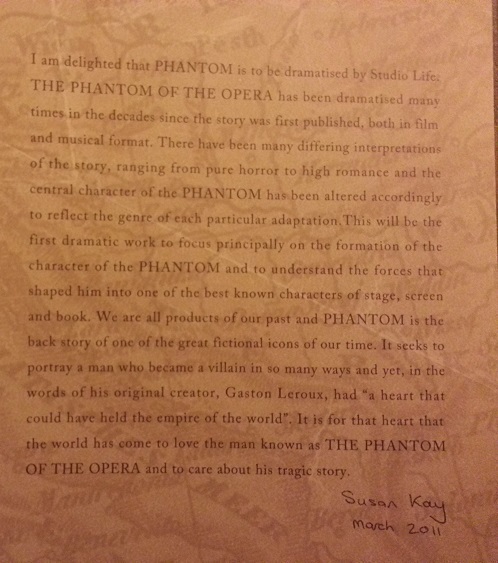 Please feel free to PM me if you have any questions about ordering "Phantom" (or any other items) from Studio Life. I have also posted this message on the POTO.com forum. I try it later at home maybe I need help! 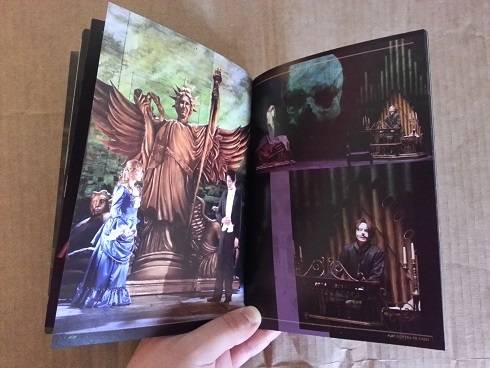 If anyone who wants to buy the Japanese stage version of Susan Kay's "Phantom" is having trouble ordering it, please feel free to PM me. I will be happy to walk you through the ordering process. The production is extraordinary. 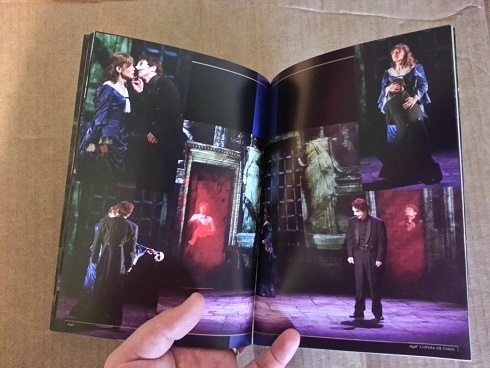 It is visually stunning, thanks in no small part to Matt Kinley's and Nick Simmons' staging and lighting. 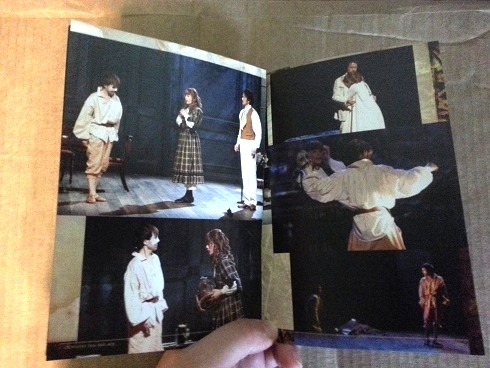 It is also incredible how faithful the two plays are to Kay's novel. 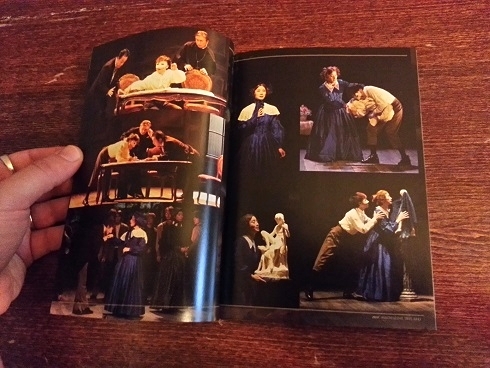 With the exception of the "Nadir" section in the second play, as well as some condensing/reordering of scenes for the sake of time, they follow Kay's narrative quite closely, the first play especially. 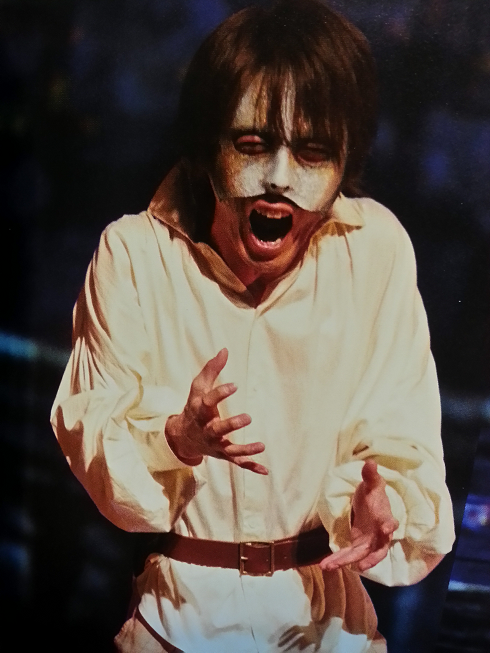 For those who have purchased the DVDs (or are considering purchasing them), I would recommend starting with Disc 1 (the "Sort" cast performing "The Untold Story") and then proceeding to Disc 4 (the "Espoir" cast performing "The Kiss of Christine"). 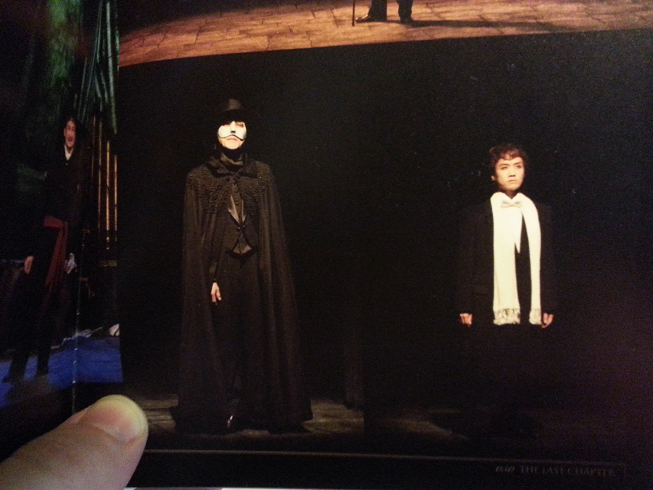 The actor who plays Erik in these two productions is amazing. 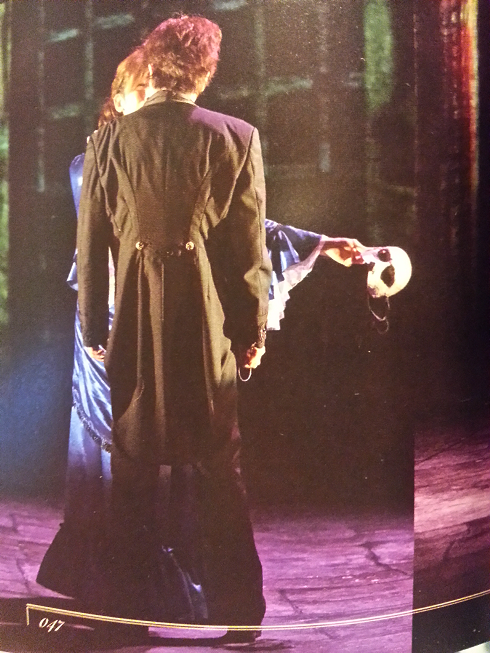 I was openly crying during his kiss scene with Christine at the end of the second play -- it was truly beautiful and tragic. Plus his obvious dance background makes him an absolute joy to watch; just seeing him take his bows at the end of "The Untold Story" is a delight. That's terrific news! Do let us know what you think of them. I've watched the DVDs four times each so far, and I get more and more from them each time I watch them. 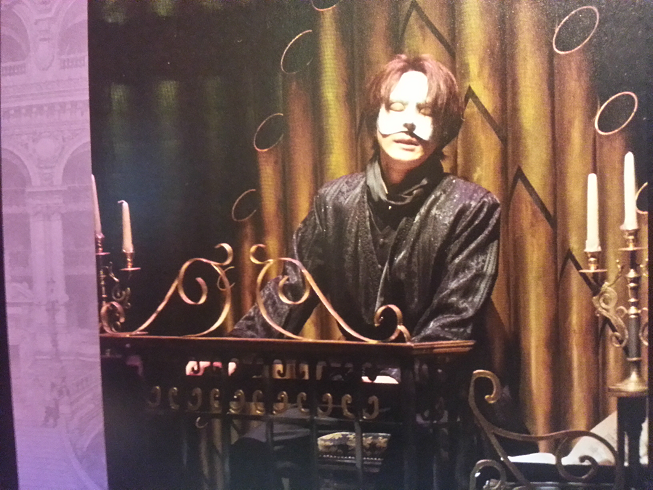 I still prefer Yoshiki Yamamoto's performance as Erik in the "Sort" and "Espoir" casts of "The Untold Story" and "The Kiss of Christine," respectively, but I find that I am also liking certain moments of Yusuke Hayashi as young Erik in the "Destin" cast and Hiroshi Kasahara as adult Erik in the "Avenir" cast. It is obvious that Studio Life put a huge amount of work into these productions. 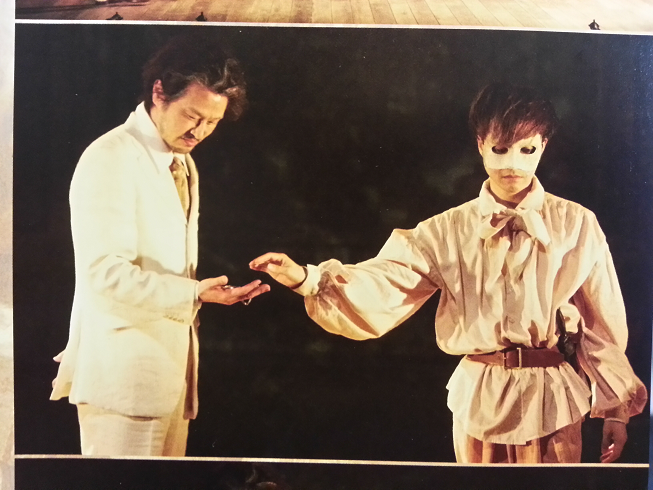 They are truly beautiful pieces of theatre. I watched the kiss as well. The kiss was moving. I will tell you more when I´ve seen all! Or DVD by DVD! Hurray!!! That is wonderful news! I agree -- the kiss scene is *very* moving. I look forward to your thoughts on the production. Yes absolutely wonderful! I think Christine is great as well. It would be great if we can ask all the performers. I will share all my thoughts here. 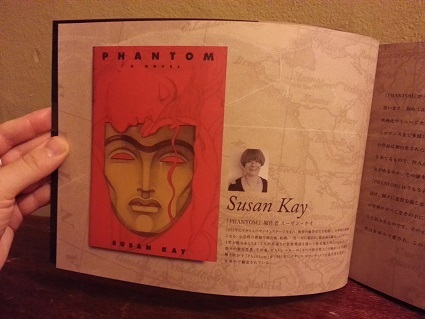 Its wonderful that they made Susan Kays Phantom. 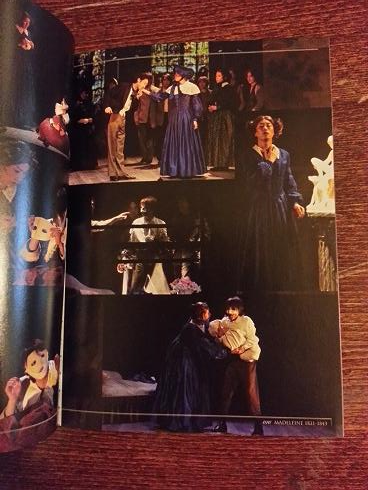 A few weeks ago, I purchased two brochures from Studio Life for "The Untold Story" and "The Kiss of Christine," and I wanted to share some of the pictures from them. 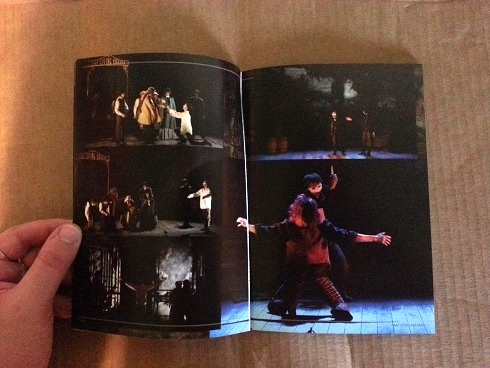 As with their theatrical productions, Studio Life has gone all out in creating these brochures, and they are *gorgeous*. 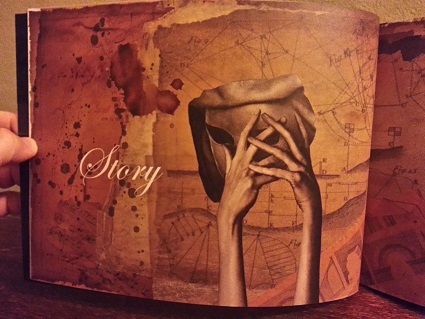 Here are some photos of the brochure for "The Untold Story." 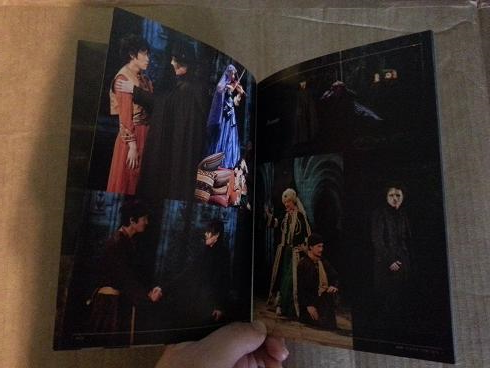 I will upload photos of "The Kiss of Christine" brochure in another post. 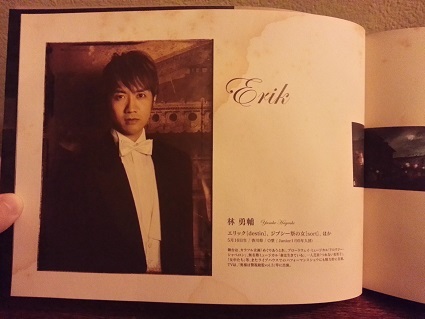 Yoshiki Yamamoto - Erik in the "Sort" Cast of "The Untold Story"
Yusuke Hayashi - Erik in the "Destin" Cast of "The Untold Story"
Here are some pictures of the brochure for Studio Life's "The Kiss of Christine." 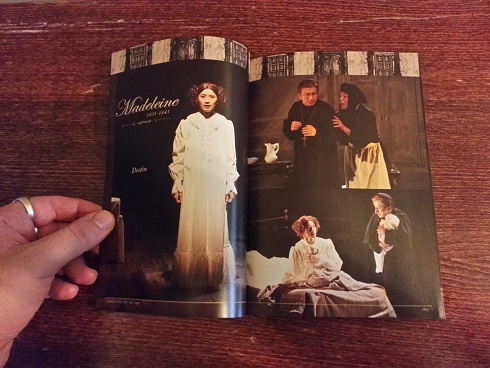 Hiroo Kasahara - Erik in the "Avenir" Cast of "The Kiss of Christine"
Yoshiki Yamamoto - Erik in the "Espoir" Cast of "The Kiss of Christine"
Hirokazu Sekido - Christine in the "Avenir" Cast of "The Kiss of Christine"
Shinya Matsumoto - Christine in the "Espoir" Cast of "The Kiss of Christine"
Wow -- very impressive brochure! They certainly did their homework/research, and it shows! Pretty cool graphics and layout -- very classy! 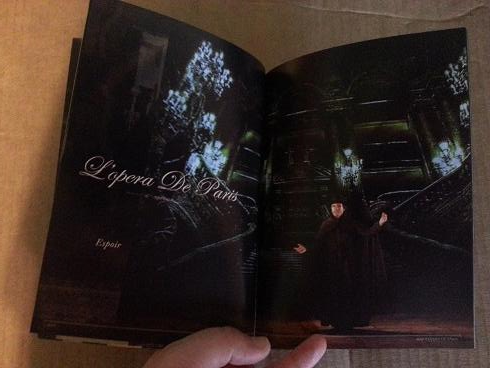 Thanks for sharing these pics with us here, FdelOpera. 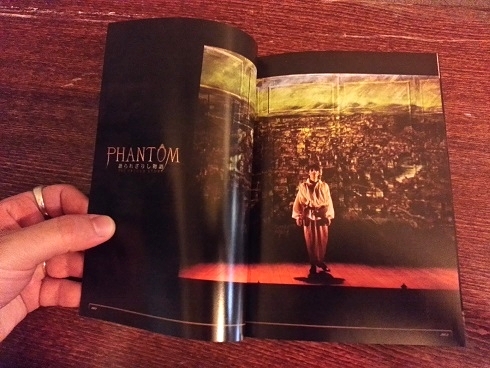 Very cool graphics in the brochure. Loving all the Palais Garnier stuff. I'm not sure whether the subject is the right material for a straight play, though. 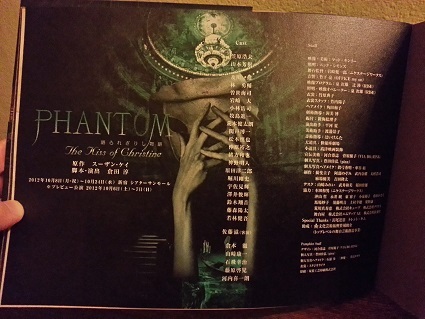 Studio Life's "Untold Story"/"Kiss of Christine" is actually one of the best stage adaptations of the Phantom story that I have seen. It doesn't beat the ALW version, but IMO, no stage version ever will. 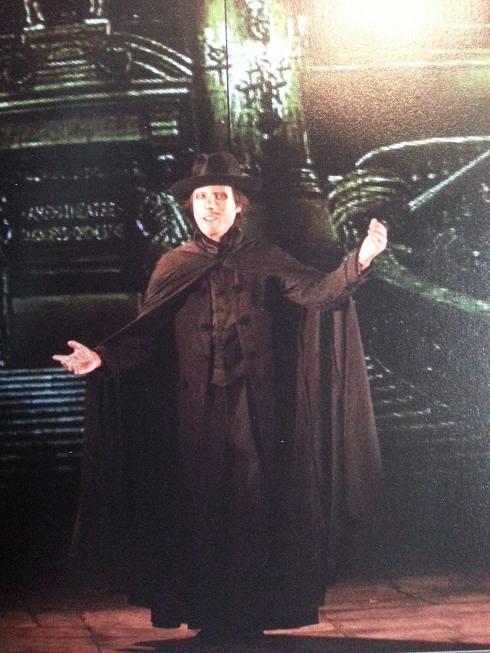 However, I do prefer it to, for instance, the Kopit/Yeston version (which I just saw last night with the *amazing* Ron Bohmer -- thanks to NightRachel for letting me know that Ron was playing Erik!!! ). Studio Life's production follows Susan Kay's narrative quite closely (so closely that I can usually understand what is being said even though I do not speak Japanese), so the "Erik/Christine Counterpoint" section is accordingly given only about an hour of stage time (1/6th of the total 6 hour run time for the two plays). However, the scenes that are there are quite wonderful (especially the "Final Lair" scene -- Yoshiki Yamamoto in the "Espoir" cast plays this brilliantly). 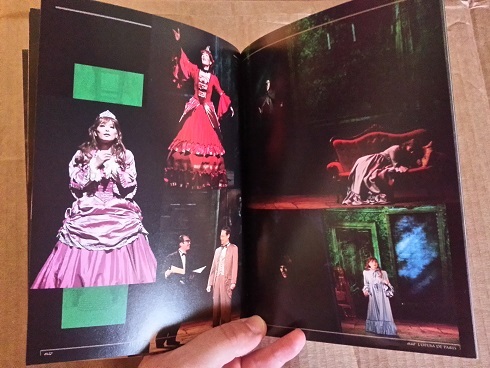 I will post some images from the 60 page booklet that came with the DVDs so that people can get a sense of what the productions look like. 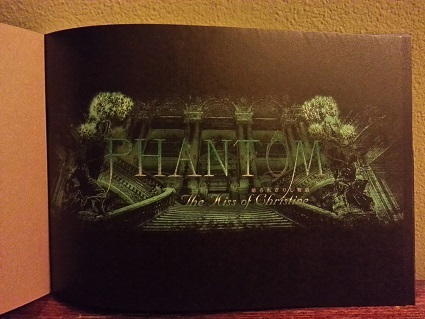 The DVDs of Studio Life's "Phantom" came with a 60 page booklet of color photos. 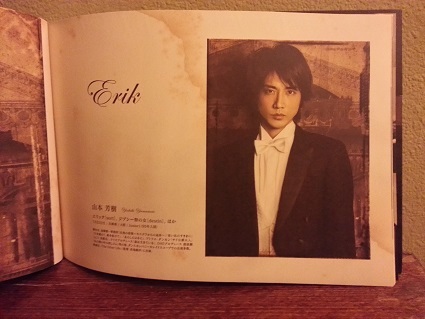 These photos are of the "Sort" cast of "The Untold Story" (starring Yoshiki Yamamoto as Erik), the "Destin" cast of "The Untold Story" (starring Yusuke Hayashi as Erik), the "Espoir" cast of "The Kiss of Christine" (starring Yoshiki Yamamoto as Erik), and the "Avenir" cast of "The Kiss of Christine" (starring Hiroo Kasahara as Erik). It really is amazing the amount of detail and care that Studio Life puts into creating their products. 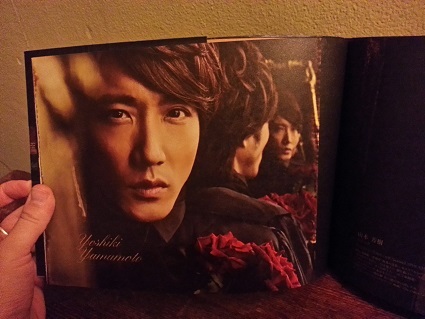 Here are some of the images from the booklet. 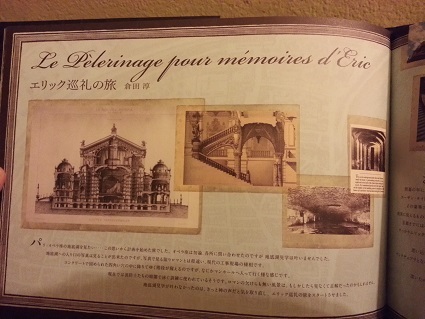 The photos that I took of the booklet are not quite as clear as the ones of the brochures, unfortunately, mainly because the booklet is glossy and the images are smaller. 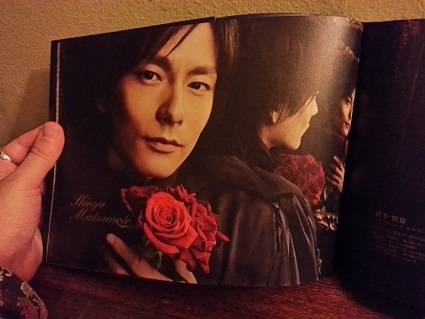 However, it will still give you a good idea of what the booklet looks like. 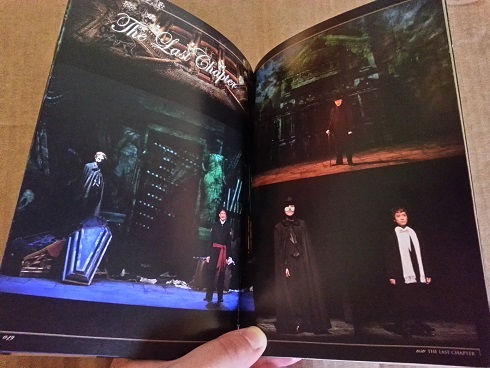 Left Page: Erik performing as "The Living Corpse"
Right Page: Top: Giovanni comforts Luciana; Middle: Erik shows Luciana his face; Bottom: After Luciana's fall - "In darkness you came to me. And in darkness you left." 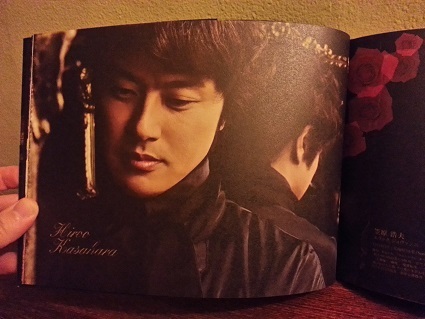 Here are a few close-ups of the booklet images. 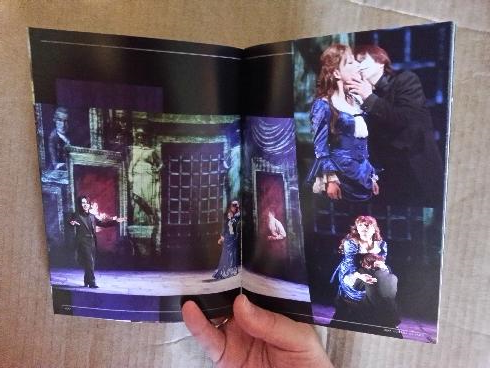 All of these images, except for the fourth one, are of the Espoir cast of "The Kiss of Christine." 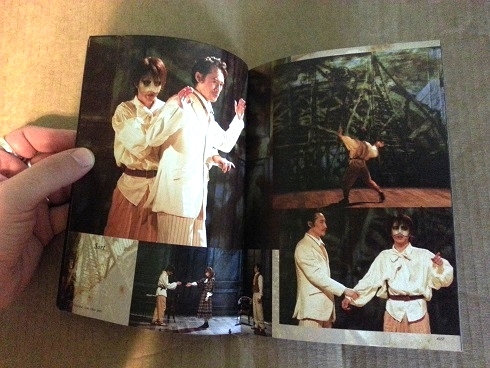 Charles is played by Yusuke Hayashi, who also played Erik in the Destin cast of "The Untold Story" and Young Erik in "The Kiss of Christine"
A member of the POTO.com forum requested that I post these images from the booklet that came with Studio Life's Phantom DVDs. I figured that some people here would be interested in seeing them, as well. Erik encounters Giovanni for the first time - Destin Cast of "The Untold Story"
Erik returns Giovanni's pocket watch - Destin Cast of "The Untold Story"
Erik screams after being cornered by Luciana and Giovanni - Sort Cast of "The Untold Story"
Over the past couple of months, I have received a number of requests to upload the entirety of Studio Life's productions of Kay's Phantom to YouTube. Now, I will not do this because it is possible to purchase the DVDs from Studio Life using third-party shipping companies like http://Anislo.jp and http://Tenso.com and thus my doing so would negatively impact the potential sales of Studio Life's DVDs. Plus, it would be illegal. 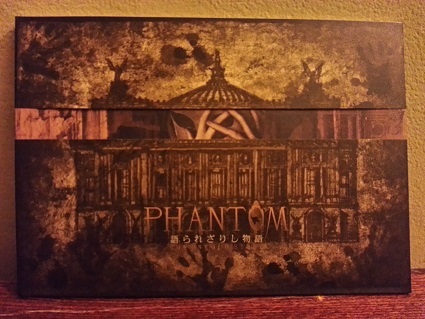 If the DVDs were out of print, or could no longer be purchased, I would have fewer qualms about doing this; I just do not want to do anything that would deprive Studio Life of any potential revenue, especially since they have put so much time, effort, and resources into these incredible productions. However, I have decided to share a few scenes from Studio Life's productions so that people can get a better sense of what the plays are like. 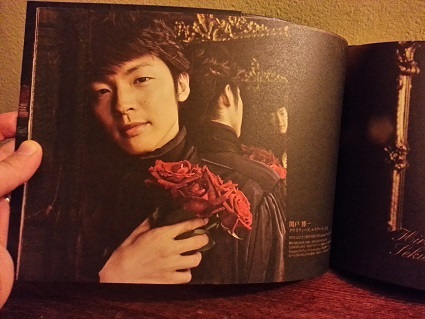 I am hoping that this will boost sales, since these clips serve as "teasers" for the DVDs. I have included a video clip from each of the four productions (Sort and Destin casts of "The Untold Story," and Avenir and Espoir casts of "The Kiss of Christine"). I wanted to make sure that all three Erik actors from each of the four productions were represented. Damn! 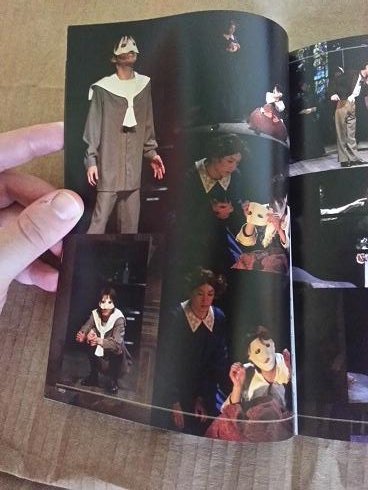 It makes sense that the plays are performed in Japanese, but bummer! They sound awesome! Wow! Does anyone who's bought the DVDs know if they have an English dub track and/or sub-titles?